Standing and Singing better on new aluminium feet ! 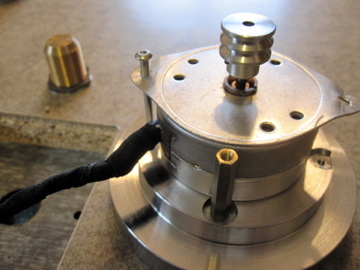 Turntable feet are important; they prevent or reduce the ground-borne vibrations from reaching the turntable plinth and thus interfering with the proper tracking of the record grooves by the stylus. 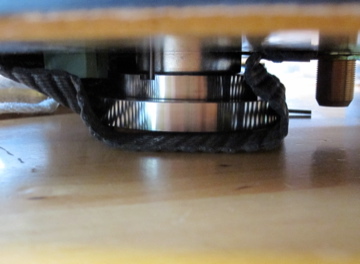 Most budget turntables come with rubber feet, e.g. 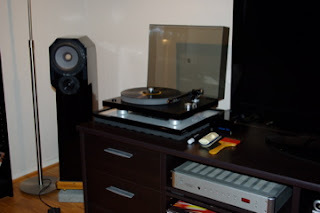 Rega RP1 to P5, Pro-ject 1.2, Linn Axis and Thorens TD295MKIII. 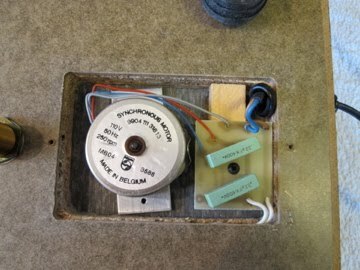 Rubber feet offer basic isolation but not good enough for "audiophile" decks. 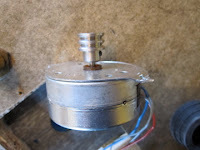 We notice quite a number of the expensive models of turntables in the market are equipped with aluminium isolation feet instead of just rubber feet for better sonic performance. 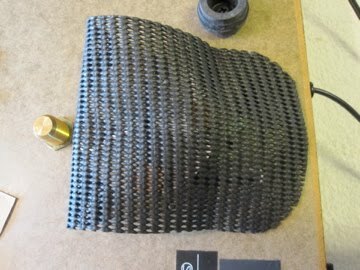 These aluminium feet are usually either rubber-damped or sorbothane-damped. 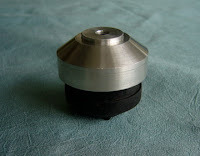 Something newly designed for my Planar 3 TT (and other Rega TT's) : aluminium isolation feet (à la Rega P7/P9 TT feet ) of anti-resonance design, retrofit with the existing Rega rubber feet - going green! 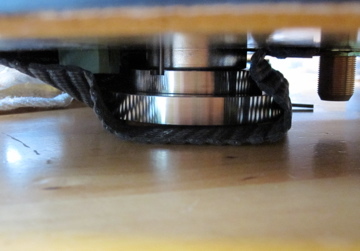 Besides significant sonic improvement , the TT with the new aluminium feet now stands firmer and taller (by~ 1/2" or 12 mm) allowing more room for the thicker tonearm wires. Installation is simple, just a screw driver ! 1. Remove the original rubber feet and fix the aluminium ones with the screws provided. 2. Smear some vaseline on the rubber before pressing it into the aluminium feet. 2. 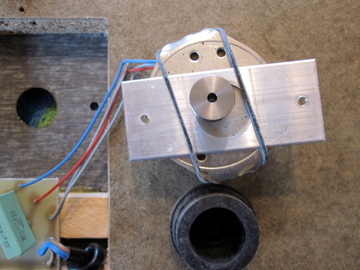 With the help of a screw driver, press fit the rubber into the the aluminium feet. 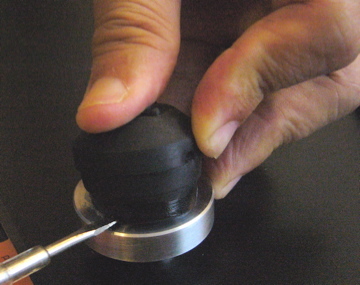 Seal the bottom holes of Rega rubber feet (e.g using tape) and fill them up with sand (about 20g or 0.7 oz) . Then retrofit them to the new aluminium feet and test. It is surprising - I used to listen with volume control set between 9 to 9.30 o'clock, but now I can get the same result between 8.30 to 9.0 o'clock and the background noise is quieter. You can always reverse it if you wish! Adjust the feet a little higher you could even put the TTPSU just below the plinth if you wish. 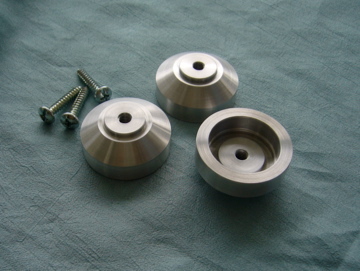 The new aluminium feet are suitable upgrades for Rega turntables, model RP1, RP3, P1, P2, P3, P3-2000, P3-24, P5, P25, Planar 2 and Planar 3 TT's. "I have big floorstanding Axiom m60ti speakers that are less than 3 feet away from my turntable and your feet dramatically helped in the isolation. I can now give a "HARD TAP" anywhere on the stand without getting any feedback. " 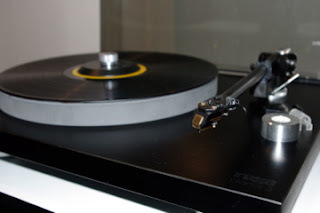 Just wanted you to know that I finally got my SUT back and I am astonished at the improvement gained from aluminium discs being added to the feet of my Rega.The sound is noticably more focused and nuanced. " "They look beautiful and, along with the other modifications, really enhance the sound. " "Hi, received the alu feet. Tight squeeze to fit, but once done gave a notable improvement wrt more defined bass. " I bought Michael Lim's aluminium feet with his double pulley for my modded RP3 about 6 months ago and was impressed by the improvement in performance. At the time I filled the original inverted rubber feet (which fit into the aluminium caps) with sand at his suggestion. I guess I made a number of changes all at once so it was difficult to tell what was doing what in terms of performance gain. 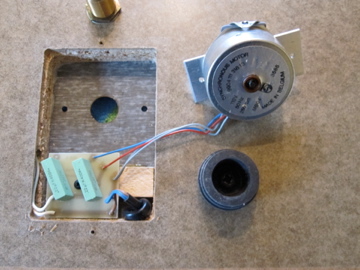 While I was realigning my cartridge this weekend I emptied one of the feet of sand, thinking I might go back to the original rubber feet, only to find the plinth would then be too low for the cable exit from the arm. I put the foot back without the sand in it, and low and behold the bass had seriously diminished when I next listened to the table. I took the foot off, filled it back with sand, and the bass returned. OK, so scientifically I should have emptied all of the feet of sand, but it's a bit awkward refitting the rubber cups and I was feeling lazy. I was really impressed by the difference in sound by the a-b-a test though - it's so much fuller and richer with the sand in place. Presumably it's a bit like a sandbox but inside the feet. Someone mentioned they were going to fill their feet with modelling clay, but I'm not sure this would work as well - I suspect it's the loose particulate nature of dry sand that makes it so good at damping and helps bass response. 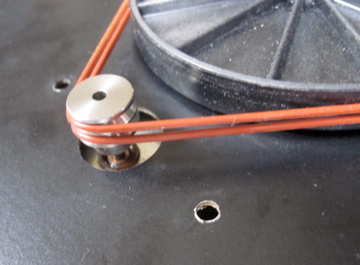 I'm not sure whether you can do the same thing with the P9 feet that come on some of the other Rega models? 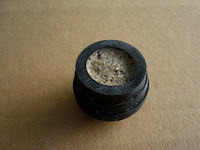 It also makes me wonder whether sand might make a good plinth material for idler turntables like the Lenco / Garrard etc? I took the Lim feet and filled them with modeling clay to avoid any mess. I also think they work pretty well. I got the package and have installed the feet - nice product! Just a comment/suggestion you may want to pass on - my original rubber feet had a slight lip which made it impossible to fit them into the aluminium feet. 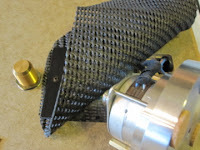 I mounted a hex screwdriver bit into my cordless drill and stuck the rubber feet on (small end to the chuck) and lightly beveled the edge on a piece of sandpaper...it made it possible to install them. Your alu feet ROCK !!!! Whooooooooooaaaaaaaa ! Filled up with quartz sand, what a difference! I am speechless. Seriously. Thanks! And also thanks for the pictures, Harry!